Collected by Percy Horace Gordon Powell-Cotton and his wife Hannah Powell-Cotton (nee Hannah Brayton Slater) on 30th March 1933 during a shooting expedition [RTS 29/9/2004]. Tobacco bag suspended from a long carrying loop. The bag has a long, rectangular body, formed from thin twisted plan fibre string, bias-woven together to form a tight network pattern with small regular openings in the sides. This has been woven as a continuous cylinder that is open at the top and closed at the base. This is currently pressed flat, but would change to a more rounded shape when full. It has been decorated on the outer face with three groups of fringes, made from 21, 23 and 25 lengths each. Each length is made from a plant fibre, looped through the body of the bag and the ends then twisted together on the other side to form a narrow string. This differs from the way in which the fringe of 1934.8.95 has been attached. Each string has been threaded with from 20 to 35 small glass ring-shaped beads, with the end secured in most cases by a tight knot, although this has worked loose on some examples. The majority of these are opaque white, but other colours have been randomly added, singly or in groups, including red (Pantone 201C), dark blue (Pantone 281C), translucent light grey (Pantone 420C) and white with blue stripes (Pantone 2728C). The bag body is a yellowish brown colour (Pantone 7509C). At its top, the bag has a thick, flexible mouth, formed from the centre of the carrying loop body, which divides into two thick sections. These have been wound round with thin string forming a tight, cylindrical section. The upper ends of the bag's network body has been woven in with this binding to attach the two parts together. This binding has created a lentoid shaped mouth, which opens when its ends are compressed to present a rather tight aperture. On either side of this mouth, the carrying loop continues with further cylindrical binding, the ends of which are currently loose, before dividing into multi stranded sections of 32 strings on each side. Each of these strings is made of 2 ply plant fibre strands. After continuing for 25 to 27 mm, these strands rejoin to form single cords, secured with further cylindrical binding,, and are then plaited on the other side with their ends knotted to prevent them becoming frayed. The two sides of the loop are fastened together at the top in a loose knot. This object is nearly complete, but some of the fringe has lost its knotted ends and a few beads may also have been lost. The interior of the bag is not strongly scented, and apart from faint staining of the lower body and some dirt on the lowest bead fringe, this object looks very clean compared to 1934.8.95. It has a weight of 66.5 grams. The loop and bag have a total length of 552 mm. The bag body is 122 mm long and 52 mm wide, while the lowest fringe has tassels that are 72 mm long. The beads have typical diameters of 2.5 mm and thicknesses of 1.5 mm; the cylindrically bound part of the carrying loop has a diameter of 5.6 mm, while each individual strand is 1 mm wide. Collected by Percy Horace Gordon Powell-Cotton and his wife Hannah at Lomo on 30th March 1933, during a shooting expedition. These bags were worn around the neck, and used to store tobacco; they are known as logolute. For a similar pouch collected by Powell-Cotton, see 1934.8.95. This is very similar in style and technique, but less heavily beaded and the carrying loop has been covered with red ochre. Detailed Pipes [Unsorted] Card Catalogue entry - Description: Tobacco-pouch. 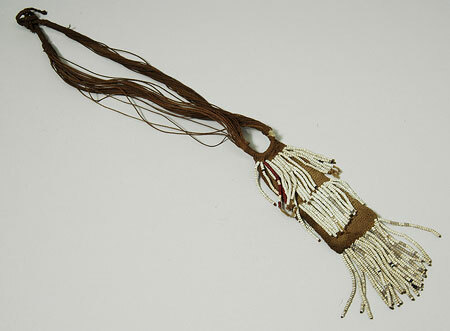 Small narrow and elongated pouch, woven from thin brown string and ornamented with three bead fringes [insert] Two straight across one side, the other at the bottom [end insert]. The beads are mainly white - with a few coloured ones here and there. From the top corners of the bag a long loop of the separate strings ends in a plaited knot. [insert] the loop ends are plaited and loosely knotted together [end insert]. Length - Pouch and loop c 52 cm: pouch alone and without end fringe 12.5 cm pouch with fringe length 19 cm People: Lango. Locality: Lomo, E. Sudan 4˚5'N 32˚57'E. Native name: Logolute. Collected by: Major Powell-Cotton (403). How Acquired: dd Major Powell Cotton 1934 [Drawing]. Card Catalogue Entry - There is no further information on the tribal catalogue card [RTS 24/5/2004]. Related Documents File - Typewritten List of "Curios Presented to Dr. Balfour by Major & Mrs. Powell-Cotton. Lango Tribe". This object appears as item 403: "Tobacco pouch, plaited fibre string belt, 3 rows white beads, few red, native name Logolute , 30/3/33 Lomo, 4.5 N 32.57 E”. Also contains details of a cine film 'some tribes of the Southern Sudan', taken by Powell-Cotton during this 1933 expedition, copies of which are now in the National Film and Television Archive and the Powell-Cotton Museum in Kent [RTS 14/3/2005]. Old Pitt Rivers Museum label - Logolute , Tobacco-pouch. LANGO, LOMO, E. SUDAN. 4° 5' N., 32° 57' E. d.d. Major Powell-Cotton, 1934 (403) [rectangular metal-edged tag, tied to object; RTS 30/9/2004]. Sparks, Rachael. "Lango tobacco pouch" Southern Sudan Project (in development). 03 Jan. 2006. Pitt Rivers Museum. <http://southernsudan.prm.ox.ac.uk/details/1934.8.94/>.